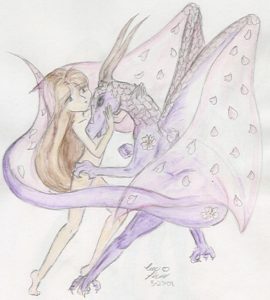 Commission for Liryen by Amyla – an imaginative portrait of Liryen as a dragon. This is a challenge for me. I do not consider myself much of a writer. I am dragon. How is that for a great start? How does it feel? Awkward sometimes. It is a feeling of connectedness with the flows. The flows are energy fields that surround everything. For example, the Force in Star Wars. I can feel the form of a great serpent – in fact there are even times I can see it. I find my actions reflect that of having greater size or bulk. When I “put on the dragon” (a term I use for being draconic) I feel very old. Not as in years, but in time. My head will swing around on a long neck as I turn to look at something. It will feel very large and long. My eyes will feel as though the bridge of my nose has grown and I am looking down the length of it to see. My chest expands and the lungs are audible and loud in my ears. There have been a few times I have grumbled and the chest rumbled, vibrating right up to my ears. There are many varieties of dragons. Books are filled with them. Unfortunately there are no books on becoming one of them, but for me it is a knowing inside. I do not have two wings, four legs and a tail, but there are times I can feel them. I mean really feel them. The body is human, yet just beneath the surface I can feel parts that shouldn’t be there. It is a very real and scary feeling when the dragon tries to take form and my car suddenly starts getting tighter and smaller. The chest feels larger and deeper, the collar bones grow outward well past shoulders that are no longer there. It becomes a great hollow space in my chest and the lungs sound so very loud in my ears. It is such a realistic experience that the body aches as it tries to conform. The bones feel as if they will spring forth while the body explodes from the effort. My back literally disappears in my mind’s eye. I am not sure yet why this is so. I feel great wings that make the shoulder blades burn and itch. During these times I cannot lie on my back at all. I get uncomfortable sitting, (Tails are not made for sitting upon.) so I wander around until things settle down again. I cannot tell you what sort of dragon I am in breed (for lack of a better term) as I am looking from the inside out most of the time. 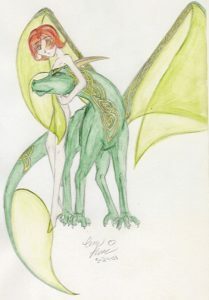 A good friend once drew me as he saw the dragon. The drawing is a wonderful gift that I cherish. I am a firedragon. Does it mean I like fire? I suppose it must, although I do not do long periods in the sun very well. This body is fair complected and burns easily. I don’t take the heat well because I have become nocturnal after many years of working nights. I love being around water. I find it invigorating unless I become waterlogged. A water logged firedragon is not a happy camper. I digress – so back to being the dragon. My healing factor has increased, and it is a good thing since this body is not as young as it used to be. My night vision is good unless my eyes have a flashlight pointed at them. Well, on to other things. I am tempermental (just ask anyone). I am a little stranger than most other dragons as I prefer my meat well done. (Although I do recall one or two veggie dragons, too.) I don’t like confinement. I start to feel too large for the room and start wishing for folks to stop breathing. There are many other things about me, but I don’t think they are particulary dragonish as much as just otherkin-ness. I am protective of my friends and take it personally when they are hurt. I will jump in front of anyone that cannot defend themselves sometimes without thinking. I believe in honor, but I have my own code of ethics that I follow. I have a long memory. These could be about anyone not just being dragon. The bottom line is only you know what you are..It is a feeling a knowing, something worth exploring until you know for sure. I can tell you that I see you as an ant but if you do not feel it then what I say matters little. Otherkin go through many changes as they awaken, so the forms may change as they explore the possiblities. The lucky ones know who they are and even have memories while the rest of us have to remember a piece at a time. These are only my experiences. Nothing is set in stone. traits given better than most dragons do. of how I define dragons: I dont. this definition give a good picture of what was really there? way, so dont get left behind by that much. the flexibility to survive in this world. call thinking creatures a narrow category. from other people possibly be a good thing? dragon wont be the only reason. its not normal every-day interaction. cause they surely wont fit you. “So how do you define a dragon?” I was asked. actually a question no ones ever asked me before. Unbelievable, I know. answer, but now I do. of courses of action and that is, usually, enough. dragon will notice you at all. warning from a firm base of prolonged thought. but mostly stay the same within patterns. than getting them as hand-me-downs. friendly or introverted. They are islands. intense because dragons are not perfect. being honest. If they respect you. If not, all bets are off. well even if their minds say yes. it but you would never think of sharing that space with them. shy and in need of friends.